James — just make sure you know the address of the nearest Laundry. This entry was posted in Skiffy and tagged Charles Stross, James H. Burns by Mike Glyer. Bookmark the permalink. Uh, oh, looks like someone “made tea”. That could be very bad indeed. 2 eggs for $450? What kind of eggs? 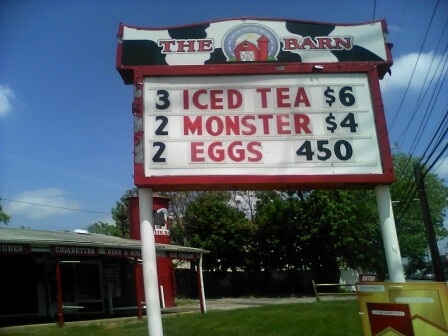 At least monsters are fairly cheap – the eggs (one hopes) are cheep…. I think the Black Chamber would have “issues” with a gay goth couple named Pinky and The Brain. Maybe not – even the FBI has hit perception level One that the cyber security folks they need to hire have smoked pot at least once…. You only really have to worry when you find Eggs Sothoth on the menu. How do you find a secret govt organization? Not like they have a website like nsa.gov – umm, never mind. bandit: or just speak loudly and clearly into the flower arrangement. MickyFinn: I need to fix my tin-foil hat because they can hear thoughts…..
We could have run a photo, saying what the heck was the van doing here? –And then shown this sign, truly a few blocks away…! I dunno why people get so “worked up” over Scooby Doo. It isn’t a mystery if there’s only one suspect.